In my couponing journey, I have learned that this skill is not for the faint of heart. It is more than saving a few dollars off your grocery bill. It is a skill that must be studied and continuously improved over time. It involves strategy and will become like a game. I never thought of myself as very competitive before, but suddenly I was standing at the register, attempting to beat my latest savings percentage. The thrill of saving money is exhilarating! Have I peaked your interest yet? What if I told you that you never have to pay for toothpaste again? Or that you can get discounts just by asking for them? Or that couponing can actually make you money? We must make the distinction between Free Products, Practically Free Products, and Moneymakers. Your coupons and rewards covered the entire amount of the product. You didn’t pay any money out of pocket. It was truly free. Good job! You pay some amount of money out of pocket, but earn the money back through rewards or rebates. Technically, if you pay $1 and then get $1 back, it is considered free. However, you did still pay money for it. This is definitely okay, even better than okay! It is still a good deal. However, to minimize out of pocket costs, you can use rewards to pay for products and then get the rebate. This is considering “rolling” rewards and can turn the product into a moneymaker! When you stack sales, coupons, rebates, or rewards to cover more than the amount of the product. This usually happens with reward programs and rebates. This is the type of deal that can actually make you money from shopping! Start by signing up for the rewards program at the grocery store and drug store of your choice. Then download the apps for all of these stores. This will be very important for managing your rewards and e-coupons. Many grocery stores give out e-coupons for free products. For example, Kroger has a free product coupon every Friday. These websites will post the latest deals at most major stores and give saving instructions. Look through the weekly match-ups and other deals. They also have a crucial couponing tool, a coupon database. If you are looking for a coupon on any product, the coupon database will tell you where to find it. If the coupon is in the newspaper, it will tell you what week and which insert. If the coupon is online, it will tell you where to print it. This is so important when planning your grocery list. Rebate Apps are apps that give you money back for buying specific products and submitting receipts. Cash back specific items for grocery, household, medicine, apparel, alcohol, etc. Ibotta also has opportunities for bonuses and a great referral program. Use code: raiyjz when you sign up to receive $10 after submitting your first rebate! I have earned over $300 cash back on this one app! Cash back on grocery and household goods. Always count on this app to save 25 cents off produce each week. This adds up! Plus, bonus opportunities for buying specific items. But wait... what about actual coupons? Manufacture coupons come from the companies who make the products. Found in your Sunday paper. Can only print 2 of the same coupon per computer. So, use more than one computer! Always try to print in black ink. Color is expensive. Store coupons come from the retailer (such as Target or Kroger). Can be stacked with manufacture coupons for extra savings! Always be kind to your cashiers. Ask for discounts wherever you go, if you follow the tip above, employees will usually tell you how to get an extra discount. Never use a coupon just because you have it, only if you need the product. Always try to minimize your out of pocket costs. Spending money to save money is still spending money. 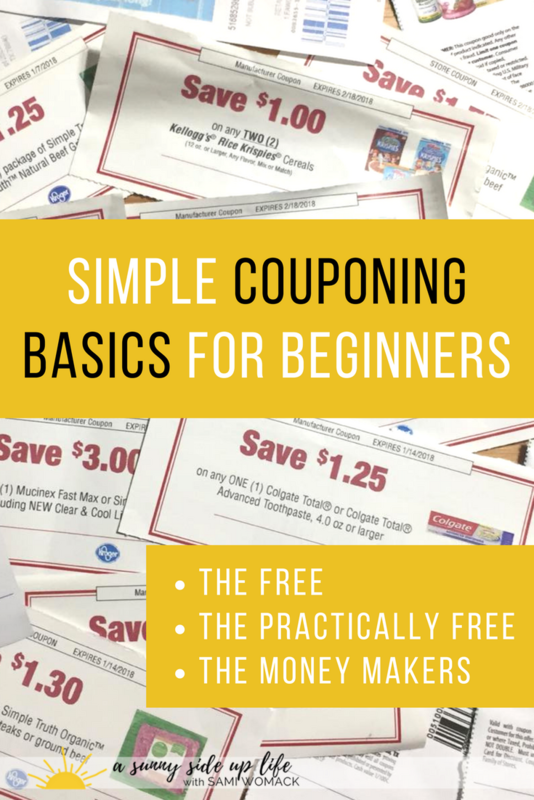 Now you see, coupons are only a part of the process of couponing! Couponing is defined as the art of stacking sales, coupons, rebates, and rewards in order to save the most amount of money. A coupon may save you 50 cents, but stack that with a sale and rebate and you will be building your grocery stockpile in no time! Kelsey Henry is the writer behind Positively Delighted. She fell in love with personal finance at a young age by taking the Dave Ramsey Financial Peace Homeschool Program. She then found her passion for couponing while majoring in Digital Retailing at the University of North Texas. Her post “Couponing in College 101” was a top-ten featured article for the DealSpotr Couponing in College Scholarship in 2016. In her spare time, she is a country singer/songwriter, owns a greeting card company, runs an Amazon business, and is writing a book about growing up in an RV. Follow Positively Delighted on Instagram!